Announcement Thank you for visiting Hungry Soaps! I am in the process of relaunching my etsy store. Be sure to check back often for the newest listings. 100% Handmade deep in the heart of Texas! We make our soaps and bath treats with natural butters and oils. Common ingredients used in our products include the following: Coconut Oil, Olive Oil, Safflower Oil, Mango Butter, Shea Butter, Avocado Oil, Avocado Butter, Palm Oil, Cocoa Butter, Sunflower Oil, Rice Bran Oil, and Castor Oil. Thank you for visiting Hungry Soaps! I am in the process of relaunching my etsy store. Be sure to check back often for the newest listings. I love these bath bombs!! I’ve been using them regularly for many years now, and they always leave my skin feeling so soft and smelling so good. I recently bought the pink salt and water lily scent, and it’s my favorite right now! I can’t rave enough about the bath bombs! I became interested in soap making when diagnosed with a condition called Poly Cystic Ovarian Syndrome(PCOS). I learned that my problematic skin conditions like acne and dryness were caused by PCOS and allergies to sulfates(detergents found in most commercial products).This led me to start researching natural products and how they were made. A friend gave me my first bar of cold processed soap and I fell in love with how my skin started to feel. 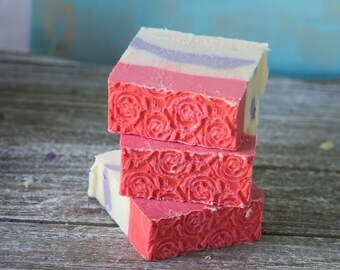 I began making soap as a creative outlet after having my children. These days my kids play an important role in my business not only in helping package products, but also in product ideas, to include my soda soaps and tinted lip balms. Another area I really love is experimenting with fragrance and colors. I love fragrance and I love color, combined they are powerful expressions of creativity. Nothing makes me smile more than cutting into a loaf of soap and seeing the colors and smelling the fragrance or making a bath cupcake and adding frosting to the top. It is my joy to share my creations with you and my hope is you will enjoy them as much as I do. Carissa is a wife and homeschool mom to five kids. In her down time she enjoys a good cup of coffee and a good Christian romance novel. She grew up on the open prairies of Central Texas and now makes her home in South Texas.